Why Would I Need To Clean My Mattress? 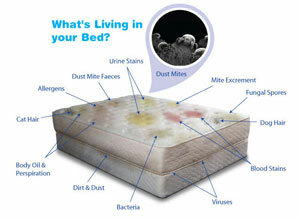 It is estimated that there are over 2 million dust mites in the average matress! So, what is the mattress cleaning process? Complete vacuuming of mattress surface with high powered hepa filtered vacuum that creates vibration and extreme suction to loosen, release and contain these harmful contaminants. Sterilize mattress using our industrial strength UV lights (same lights used in hospitals for sterilizations) this process kills all dust mites as well as all eggs that have been laid. It also prohibits any growth of disease causing bacteria, viruses and spores. Apply our specially designed Allergy Relief Treatment which deactivates the allergens found in your mattress as well as in dust mite feces that triggers the body’s allergic response. This method is used if surface of mattress is visibly soiled, stained or has an odor. Extract residual allergens and soil while rinsing the mattress with our Anti Allergen Hypo Allergenic fiber rinse using our state of the art low moisture upholstery tool. Sterilize mattress using our industrial strength UV lights (same lights used in hospitals for sterilizations) this process kills all dust mites as well as all eggs that have been laid. It also prohibits any growth of disease causing bacteria brought on by urine, blood and food.